What if testing yourself for cancer or other diseases were as easy as testing your blood sugar or taking a home pregnancy test? In a few years, it might be. Chemists at The Ohio State University are developing paper strips that detect diseases including cancer and malaria—for a cost of 50 cents per strip. The idea, explained Abraham Badu-Tawiah, is that people could apply a drop of blood to the paper at home and mail it to a laboratory on a regular basis—and see a doctor only if the test comes out positive. The researchers found that the tests were accurate even a month after the blood sample was taken, proving they could work for people living in remote areas. The assistant professor of chemistry and biochemistry at Ohio State conceived of the papers as a way to get cheap malaria diagnoses into the hands of people in rural Africa and southeast Asia, where the disease kills hundreds of thousands of people and infects hundreds of millions every year. But in the Journal of the American Chemical Society, he and his colleagues report that the test can be tailored to detect any disease for which the human body produces antibodies, including ovarian cancer and cancer of the large intestine. “We want to empower people. If you care at all about your health and you have reason to worry about a condition, then you don’t want to wait until you get sick to go to the hospital. You could test yourself as often as you want,” he said. Instead of regular ink, however, the researchers use wax ink to trace the outline of channels and reservoirs on the paper. The wax penetrates the paper and forms a waterproof barrier to capture the blood sample and keep it between layers. One 8.5-by-11-inch sheet of paper can hold dozens of individual tests that can then be cut apart into strips, each a little larger than a postage stamp. “To get tested, all a person would have to do is put a drop of blood on the paper strip, fold it in half, put it in an envelope and mail it,” Badu-Tawiah said. The technology works differently than other paper-based medical diagnostics like home pregnancy tests, which are coated with enzymes or gold nanoparticles to make the paper change color. Instead, the paper contains small synthetic chemical probes that carry a positive charge. It’s these “ionic” probes that allow ultra-sensitive detection by a handheld mass spectrometer. Badu-Tawiah and postdoctoral researchers Suming Chen and Qiongqiong Wan successfully demonstrated that they could detect protein biomarkers from the most common malaria parasite,Plasmodium falciparum, which is most prevalent in Africa. They also successfully detected the protein biomarker for ovarian cancer, known as cancer antigen 125, and the carcinoembryonic antigen, which is a marker for cancer of the large intestine, among other cancers. They worked with former doctoral student Yang Song in the lab of colleague Vicki Wysocki, professor of chemistry and biochemistry, to study how the probes stick to the antibodies with a high-resolution mass spectrometer. Wysocki is the Ohio Eminent Scholar of Macromolecular Structure and Function and director of the Campus Chemical Instrument Center at Ohio State. After confirming that their tests worked, Badu-Tawiah and his team stored the strips away and re-tested them every few days to see if the signal detected by the mass spectrometer would fade over time. It didn’t. The signal was just as strong after 30 days as on day one, meaning that the disease proteins were stable and detectable even after a month. Since the antibody strips survive more than long enough to reach a lab by mail, they could open up a whole new world of medical care for people in rural communities—even in the United States, Badu-Tawiah said. Even for people living in the city, testing themselves at home would save money compared to going to the doctor. In the US, he said, the tests would be ideal for people who have a family history of cancer or have successfully undergone cancer treatment. Instead of waiting to visit a doctor every six months to confirm that they are still in remission, they could test themselves from home more frequently. In the case of malaria, the human and financial costs are high, especially in Africa. Malaria is a mosquito-borne disease caused by parasites. The infection starts with flulike symptoms that can develop into kidney failure or other complications. The Centers for Disease Control and Prevention estimates that there were 214 million cases of malaria worldwide in 2015, and 438,000 people died—mostly children in Africa. “In Africa, malaria is so common that whenever you get feverish, the first thing you think is, ‘Oh, it’s probably malaria,’” Badu-Tawiah said. While the prototype test strips at Ohio State cost about 50 cents each to produce, those costs would likely go down with mass production, he said. The greatest cost of using the strips would fall to urban medical facilities, which would have to purchase mass spectrometers to read the results. Modelportable instruments can cost $100,000 but less expensive handheld mass specs are under development. Still, Badu-Tawiah pointed out, an initial investment in mass specs would be more than offset by the potential boon to Africa’s economy. UNICEF estimates that malaria costs the continent $12 billion in lost worker productivity every year. In the United States, where mass spectrometers are more common, the cost savings would come in the form of reduced insurance use and fewer out-of-pocket expenses from going to the doctor less often. 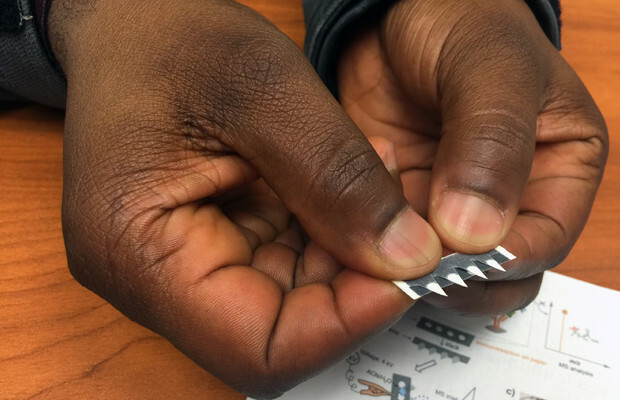 “Although this approach requires an initial investment, we believe the low-cost paper-based consumable devices will make it sustainable,” Badu-Tawiah said. “We can set one small instrument at a grocery store, then sell the paper strips for just 50 cents per test. The same for Africa, and perhaps much cheaper there.